Summertime can be a relaxing and enjoyable time of year for everyone in the family. Unfortunately, there are those who need to take some special precautions during the hot and sweltering “dog days of summer.” Our senior populations can be especially susceptible to the warm weather, and it can become dangerous to their health. 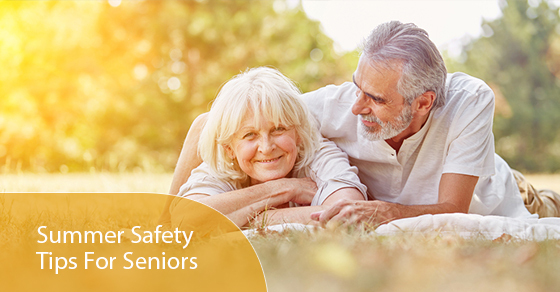 If you are a senior, or if you care for one, here are just a few elder care safety tips to keep everyone safe and healthy this summer. Staying hydrated during hot weather is critical for everyone, but especially for our senior population. Even if someone doesn’t think they are thirsty, they should be drinking water. Seniors can quickly become dehydrated without even realizing it, so keep bottled water available in the fridge and encourage them to drink at least 2-3 bottles a day. When outside seniors should protect not only their eyes by wearing sunglasses, but there head as well. Wearing a hat with a brim is a great way to stay cool. If you are caring for a senior, always have sunscreen available and be sure to apply it liberally on exposed skin before going outside. It doesn’t take long for a senior to get a bad case of sunburn. And don’t forget the bug spray if you will be near mosquitoes or other pests. Elder care is tough if your loved one doesn’t live with you. If they live alone, visit frequently to be sure the AC is set at the right temperature to keep them cool enough. Some seniors can be forgetful and not set the thermostat at the right temperature. If they don’t have air conditioning, be sure windows are open. If it becomes too hot, bring them to your home or have them take a cool shower or bath. Another way to keep your senior cool and safe is to take them to a shopping mall or movie theater for the afternoon. It will bring down their body temperature and they can get some exercise and have some fun with you. If your senior family member insists on their daily walk, be sure they go during the early part of the day when it’s coolest. Activities like gardening and lawn maintenance should be limited during the hot weather, and performed only in the early morning. Caregivers should watch for signs of heat stroke. It is quite easy for a senior to be unaware of their body temperature. Look for headaches, erratic behaviour, agitation, nausea, fainting and lack of sweat. If you do detect of these signs, seek immediate medical attention. Elder care can be a family affair during the summer. Get your whole family involved in watching out for danger signs. Everyone can take turns to keep seniors cool and check on them frequently. If you have questions or need extra assistance during the hot months, contact C-Care Health Services today.